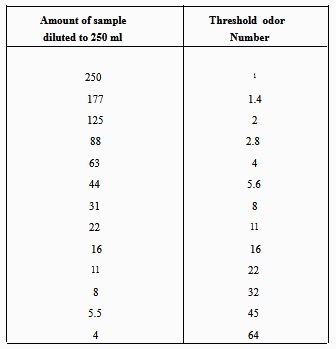 approximate odor range by sniffing the undiluted sample, thereby eliminating the preliminary test. 10. Based on the results obtained in the preliminary test, prepare a set of dilutions and use the amount of the sample diluted with odor-free water in the range corresponding to the lowest dilution in which the odor was detected. 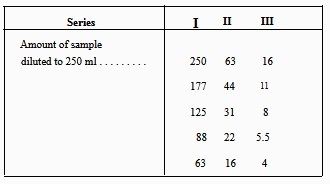 For example, if odor was detected in the 63-ml dilution, but not in the 16-ml dilution, use series II in table 7-3. 11. Repeat steps 5 through 9. The threshold number is read from table 7-4. The jar test is a reliable method for determining the proper chemical dosages and conditions for coagulation of water to remove color and turbidity. The type of chemicals that should be used for coagulating raw water can be determined by using the results from jar tests, plant tests, or by using the data shown in table 7-5. 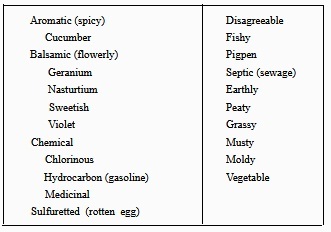 Theoretically table 7-5 is correct; however, these values can be misleading when applied to some types of raw water. The chemical content of water may have a considerable influence on the optimum pH range for the various coagulants. For example, coagulation with ferrous sulfate is usually best accomplished at relatively high pH values in the alkaline zone. With soft, colored waters, ferric coagulants may sometimes be used with considerable success at pH values of 4.0 or less. Because of this wide variation in the optimum pH range of coagulants (caused by individual characteristics of the raw water), the coagulant dosage and the optimum zone for floc formation should be determined by jar tests, rather than just relying on table 7-5. 1. Prepare a standard solution of each coagulant selected for trial by adding 10 grams of coagulant to 1 liter of distilled water. 2. Correct the pH of a sample of raw water to within the optimum range for the coagulant being tested (only if the pH is to be adjusted to the same extent in actual plant operation). Divide the raw water into six 1- liter samples.